Fancy adding an extra dimension to your days out? Then give geocaching a go. Put simply, geocaching is a modern, high-tech take on a treasure hunt and has become something of a worldwide phenomenon. Promising a fun challenge for children (and adults) of all ages, geocaching ticks lots of boxes: it encourages your kids to get out and about in the fresh air, provides a good bit of exercise, offers a chance to test their mental agility, explore different environments (great for boosting their interest in geography!) and learn about ecology, as well as enhancing team-building skills. What’s not to love?! If you’d like to find out more your first port of call is right here, where you’ll find an introduction to the hows and wheres of the wonderful world of geocaching! Remember doing treasure hunts as a kid in the back garden? Well, geocaching is a modern take on the same principle, only it uses technology to help participants find the hidden treasure. Global Positioning System (GPS) is used to hide and seek small items or ‘caches’ at a variety of outdoor locations. It’s essentially a little like using a compass for orienteering an unfamiliar location to find a hidden object. Geocachers can also place a geocache somewhere in the world, pinpointing its location using GPS and then sharing the GPS co-ordinates on the official website. Geocaches are always hidden rather than buried, so don’t require digging deep underground to locate the prize. And they can be hidden anywhere and everywhere, from remote countryside locations to places in the heart of the city. Open to people of all ages right across the world, adventurers seek out caches and then share their experiences with an online community of geocachers via the Internet. At the time of writing the official geocaching site was advertising no less than 844,397 active geocaches to search out across the world! Once you’ve located your chosen geocache you sign the online log-book and return the geocache to its original location. You can also share your stories, experiences and photos on the official site. Head to the official geocaching site first of all. You can find out all about the geocaching phenomenon, its history and background, and of course sign up to get out there and start searching. Membership is free and once you’ve signed up you can search for geocaches in your area (or another – perhaps a destination you are going to on holiday or on a day trip) and enter the details into your GPS. Or you can click on any of the live geocaches listed on the site. There are caches hidden in rural locations and cities, by the sea and in the forest, near modern buildings and ancient landmarks so there will always be a location that suits your requirements. Obviously you’ll need a GPS before you embark on your trip. Some mobile phones have an inbuilt GPS facility or you may be able to download a GPS facility onto your existing phone. Alternatively you can buy a hand-held GPS device. 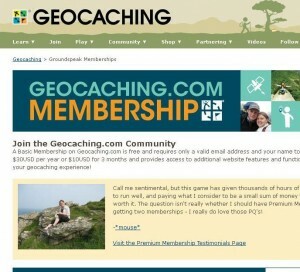 There are reviews and a buying guide on the official geocache site, which offers details of GPS to buy at Amazon.com. Once you’ve got your technology sorted it’s time to consider how much of a challenge you and your family want to embark on. For first-time geocachers it’s probably a good idea to start with an easy challenge (or in geocaching terms a ’1/1′ rated cache). Much will depend on the age of your children and your time constraints. Remember that some caches will call for some pretty tough exploration, taking a great deal of time. Others will be much more achievable so it’s important to consider the rating of the cache before you embark on your trip. Each cache has ‘attribute’ icons next to its listing providing important information: whether the cache is child-friendly, available 24 hours a day, and whether the terrain is easy, moderate or difficult, etc. You can also read some introductory text by the ‘hider’ (sometimes including cryptic clues to the cache’s location!) which will give you additional details about the location (it might be near a busy road so the hider may tell you to approach the hiding place with caution if you have young children, for example). If you’re doing a cache in an unfamiliar location, perhaps at your holiday destination for example, it’s a good idea to consult a local map in advance so you can get a bit of a feel for the surrounding area. Remember that although distances may seem easily achievable there are numerous naturally occurring obstacles – rivers, hills, etc – which may mean your expedition will be longer than you might expect. And if you’re heading off on a particularly challenging excursion, in unfamiliar surroundings, it’s a good idea to let someone know where you’re going. Be very careful to allow enough time to find your way to the cache and back to your car – you don’t want to get lost and be miles from home as darkness sets in. Suitable footwear and clothing – anoraks, an extra layer, sun hats and suncream, for example. Maps and a compass, in addition to your GPS (take extra batteries with you, just in case). Plenty of drinks and snacks – you may find your expedition leads you far from shops where you can stock up on refreshments so go prepared. A fully-charged mobile phone for emergencies. The principles of geocaching promote the building of communities and caring for the environment so it’s important to abide by this ethos when you become part of the geocaching community. The three main rules of geocaching are: “Take Something, Leave Something, Write in the Log Book”. You should make sure you replace the cache with something of the same value when you find it – remember you can’t leave a cache empty and must always place the cache back in its original hiding place with a new prize of equal value within. It goes without saying that anything placed in the cache should be suitable for all ages and legal so if you come across anything that doesn’t fulfil these criteria it should be reported. Any posts you leave online should be equally respectful and if not ‘helpful’ as such, at least informative to other users without spoiling the fun by giving the game away! Respect for the environment is also at the heart of the geocaching experience so it’s important to be environmentally responsible during your hunt. Caches should always be hidden in accessible areas which won’t involve breaking any country codes or wandering onto private land. Discourage your children from any over-zealous treasure hunting, eg. turning over every rock, snapping tree branches, uprooting bushes or vegetation, and making a general mess! Remember that caches will be hidden rather than buried so there will be no need for any energetic excavations. And if you’ve found the cache difficult to find do not do others a ‘favour’ by trying to mark out a clearer path to the hidden stash. Of course it goes without saying that no litter should be left along your trail. In fact the initiative Cache In Trash Out (CITO) is at the heart of the geocaching commitment to eco-friendly practices. The idea is to encourage every geocacher to make a dedicated effort to pick up litter as they take part in their hunts so be sure to take a couple of plastic bags with you for picking up litter when you go on your expedition. There are also annual international Cache In Trash Out events where geocachers can take part in special clean-up operations in their local area on the same day or weekend as other geocachers around the world. You can find out more about eco-friendly practices in our environment section. This entry was posted in Children & nature, Green art & games. Bookmark the permalink.